Preserving the techniques of Katayama-ryu iai-kenjutsu today and passing the tradition down to the future. 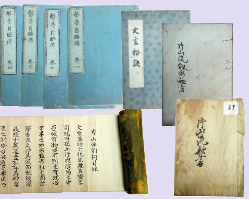 The Densho of Katayama-ryu There are a large variety of written records (densho) surviving from the Katayama family, the familial headmasters (sōke) of Katayama-ryu and today the majority of these records are preserved at the Chōkokan museum in Iwakuni. There are a variety of types of densho and they can be loosely categorized as lists of technical names and principles (mokuroku, or catalogs, and the like), detailed records of explanations on technical points (oboegaki and the like), records on theory and ideology, and records on things to keep in mind in everyday life and what actions to take in various situations, etc. Among this great number of densho, the Heisō Jirinden in particular stands out for its extensive and detailed explanations beginning with Katayama-ryu’s theory and ideology in addition to the names of techniques and the rationale behind them. For this reason it is no exaggeration to consider this work to be the primary compilation on the ideology of Katayama-ryu. Our modern lifestyle is significantly different in culture and customs to the period when these densho were written. Furthermore the severity of the bushi (warrior) lifestyle, which was directly associated with death, is radically different to our current way of life. However much of the theory, ideology and wisdom they have left behind is still of great value to us in modern times. For this reason, we would like to openly share a portion of these densho and the knowledge left to us by our predecessors.